Every animal who comes into our care was in desperate need of a hero – someone to care enough to give them a second chance, a place to grow well and to call home. Most of these animals came from places where they had never known human affection, much less friendship – and so many had come very close to meeting an early end. They all need a hero, someone to help them through the tough times and keep them going once they’ve overcome the hurdles they faced. By sponsoring a Happy Hooves resident you can become part of that ongoing story – to be their hero and help us to continue to offer a helping hand to more animals in need. 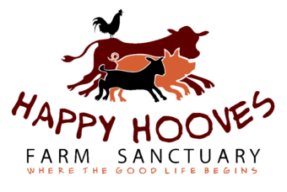 Your contribution will ensure we can continue to take care of everyone here at Happy Hooves, and go towards helping future rescues and animal welfare projects. Via bank or credit card, can be made via our GiveNow platform. All contributions over $2 are tax deductible, so they are a great investment in kindness. Invitation to a VIP tour of the Sanctuary where you can meet your sponsored animal OR Happy Hooves T shirt in your choice of size/colour. Animal Actionist Ltd (trading as Happy Hooves Farm Sanctuary) – ABN: 55167547346 – is a registered non-profit/charity with ACNC as of 21/1/14. We are endorsed as a Deductible Gift Recipient (DGR) from 21 Jan 2014, covered by Item 1 of the table in section 30-15 of the Income Tax Assessment Act 1997. Charitable Collections Licence No CC21741. View our online ACNC profile. View our charitable registration and DGR status.